October is the spookiest month of the year and many of us are heading to Halloween parties later this month. That or your kids need to bring in a fun dessert for a school party. There are so many amazing Pinterest-worthy desserts and scary creations, but we can’t always find the time to make them. I find Pinterest Fail a hilarious website, and a search for Halloween is full of epic fails. 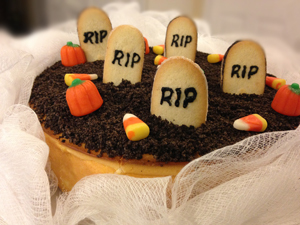 Luckily, I’m here to the rescue with this easy Halloween cheesecake – it takes no more than 15 minutes to put together (I promise) and look at the impressive results! The best part is it doesn’t even require baking! Of course you can make your own cheesecake, but if you’re running low on time or just don’t feel like turning on the oven, buy a pre-made cake. We carry an extensive line of cheesecakes (over 25 flavors!) so lucky me, I just thawed a 9” New York Cheesecake and got to work on this wonderful recipe from Chelsea’s Messy Apron. In a food processor, crush the whole Oreo® cookies until they resemble dirt (loose crumbs). Spread the crumbs evenly over the cake – if your cheesecake is a different size, you may need to adjust how many cookies you use. Squeeze some black frosting into a small resealable plastic bag. Cut a TINY corner of the bag and pipe “RIP” onto the Milano cookies. Insert the cookie headstones randomly around the cake. Place the pumpkin candies and candy corn randomly around the cake. THAT’S IT! This Halloween cheesecake is *almost* too pretty to eat. 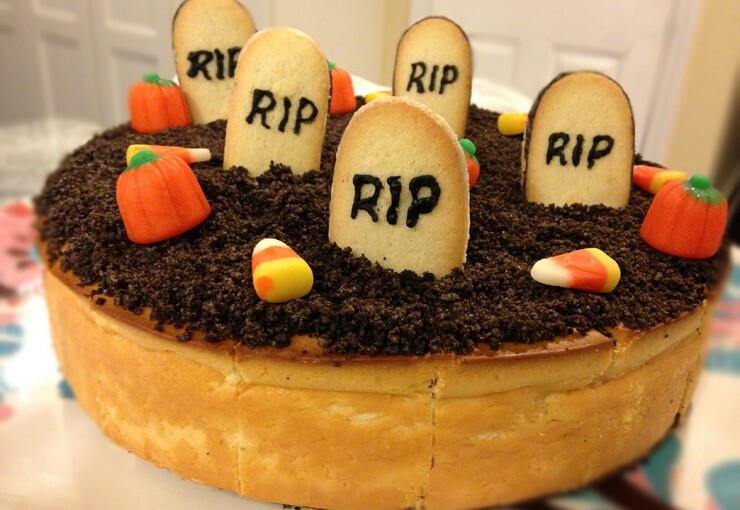 I know you can handle this super easy Halloween cheesecake even if you don’t have a lot of cake decorating skills. Your kids will love to help out with this, too! If you want to up the Halloween factor even more, buy some cheesecloth and scrunch it up around the cake. This will really amp up your décor at your Halloween party!